To this day people still mourn the loss of The Adventurer's Club which now is deserted in the once lively area of Downtown Disney known as Pleasure Island. If you are feeling a little nostalgic make this adult hot chocolate. Make the cocoa according to directions. 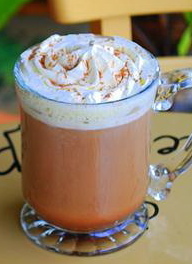 Add amaretto and coconut rum to the hot cocoa. Serve garnished with whipped cream.